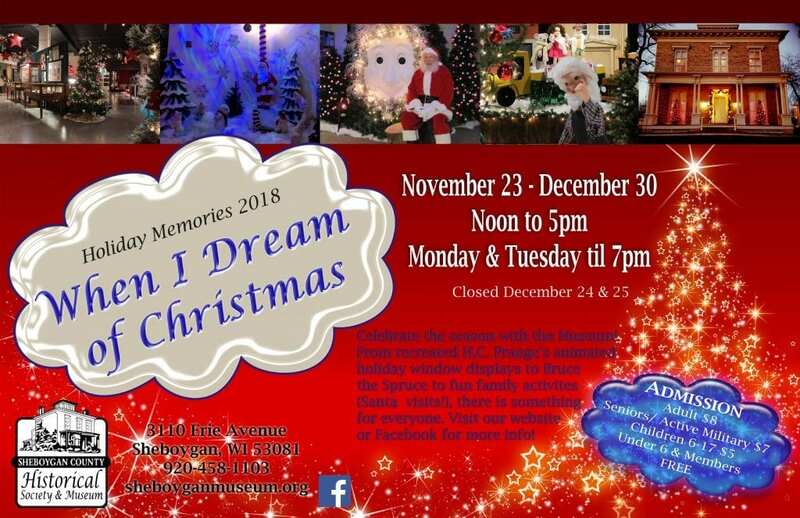 This season’s theme is “When I Dream of Christmas” which will include over fifty animated characters from our H.c. Prange’s and SantaLand collection. Visit with Santa Claus most days from November 30 to December 23 including Story Time with Santa Wednesday afternoons at 2:30. Have a conversation with Bruce the Spruce and enjoy a home-baked sweet and a cup of museum punch. The Garton Toy Co. pedal toys will be available for the wee little ones and the third car of the Make n Take train collection can be put together. Our model railroad friends will be here the opening weekend and live holiday music will be occurring most weekend days. You can also enjoy the beautifully decorated Taylor House and the traditionally decorated Weinhold Log Cabin. Mon. and Tue., noon to 7:00 and Wed. through Sun., noon to 5:00. We will be CLOSED on Christmas Eve and Christmas Day. Santa’s schedule is Mon. and Tue. 3:00 to 7:00, Wed. 2:00 to 5:00, Sat. and Sun. noon to 5:00.